Singing bowls or… Ciotola di canto. I have been developing techniques for making these bowls from crank clay over the past year. Crank clay has a lot of grog in it to make it good for hand building. Grog, also known as firesand or chamotte, contains a high percentage of silica and alumina. It produces a rough textured surface. “Ciotola di canto”. 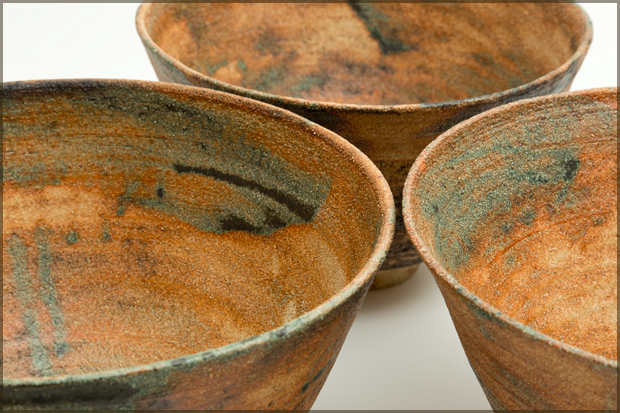 Bowls are various sizes, up to approx 30cm diameter, 15cm height. It’s been quite hard on the hands while throwing, but I enjoyed the challenge. I have glazed the bowls with copper oxide and a turquoise glaze. When you run your fingers over the internal surfaces the bowls ring softly, like distant church bells. Hence the name singing bowl. They are part of a submission to London Potters exhibition at the Morley Gallery, 61 Westminster Bridge Road, SE1 7HT. The exhibition runs from 1st December to 3rd January 2015. This entry was posted in Exhibitions, New work on November 30, 2014 by Carol.